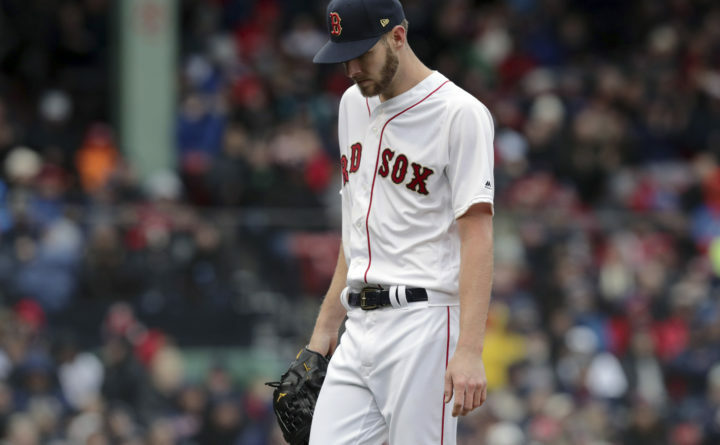 Boston Red Sox starting pitcher Chris Sale walks off the mound after the top of the fourth inning of the home opener baseball game against the Toronto Blue Jays in Boston, April 9, 2019. Regardless, the effectiveness of Sale’s fastball is nowhere near where it needs to be right now. Batters aren’t swinging as much on his fastball because Sale isn’t throwing it in the zone as often — down from 53 percent to 41 percent in just one season. The swinging strike rate on this pitch is also a paltry 1.3 percent. The rest of the starting rotation also doesn’t appear to be able to pick up the slack. It has a combined 6.17 FIP — a team’s ERA over a given period of time if the pitcher were to have experienced league-average results on balls in play and league-average timing — second worst only to the Baltimore Orioles (6.41 FIP) largely in part to allowing 28 more runs to score than we would expect given the number of outs and men on base during each plate appearance, the most in the majors and eight more than the next worst rotation, the Chicago White Sox.